Is it too hot or too cold in your area? Please call Facilities Management at 402-280-2780 and let us know so we can check it out. The Energy Management office is a part of Facilities Management. From our office in the Jelinek Building, we can control the temperature in most buildings, and control the lighting in Opus Hall and the Harper Center from the energy management control computer. We can also monitor, change set points, and run the HVAC controls systems from home if needed. With the new Tridium/Niagara control system, we can schedule time and temperature changes years in advance if needed. We use this to schedule energy saving features like night set back or lowering and raising temperatures according to seasons. It also turns air handling units on and off at scheduled times when the university is unoccupied after hours and on holidays. Since 2014, Creighton's Energy Management Team has collaborated with Verdis Group, Optimized Systems, and OPPD and has dedicated funding to 10 different projects with the goal of energy conservation and cost reduction. These projects are expected to save Creighton $1.5M annually, based on tracking trends of steam/chilled water and electricity utilization from 2014 to 2017. Read more about these projects. In June 2010, with the assistance of funding from the US Department of Energy and the Omaha Public Power District, Creighton University deployed a variety of solar and wind energy collection systems on the grounds of the main campus, including an array of solar panels that was the largest in Nebraska at the time. The collectors and associated power inverting electronics include a broad spectrum of commercially available architectures chosen as part of student-oriented research project to evaluate the performance of these renewable energy systems in the climate of Nebraska. Altogether, these collectors are capable of generating approximately 120 kW of clean, renewable energy. The first "EnergiPlant" was built in the fall of 2016 by the ERG 131 class over a couple of Sundays (about 200 total hours of labor). Embedded into each of the four leaves are 200W of flexible solar panels. Additionally, there is an accompanying 1000W wind turbine (assuming 20 - 30 mph wind). This off-grid installment currently powers four 5V USB device chargers on the benches. Following an energy output audit over the next six months, possible additions include LED lighting, a Bluetooth-enabled speaker, and 110 Vac power outlets enable laptop charging. The purchase of the EnergiPlant was made possible by a donation from the Omaha Public Power District. Our second EnergiPlant was built by Sustainable Energy Technology students in the fall of 2017. This EnergiPlant lives outside of the Harper Center, on the northwest side. Check out this College of Arts and Sciences news article on the first structure and this Omaha World Herald article on the second one. On especially hot and humid days, expect to see an email from the Energy Management team asking you to conserve your energy consumption. For more on what this means and what you can do, check out the Peak Energy Days page. 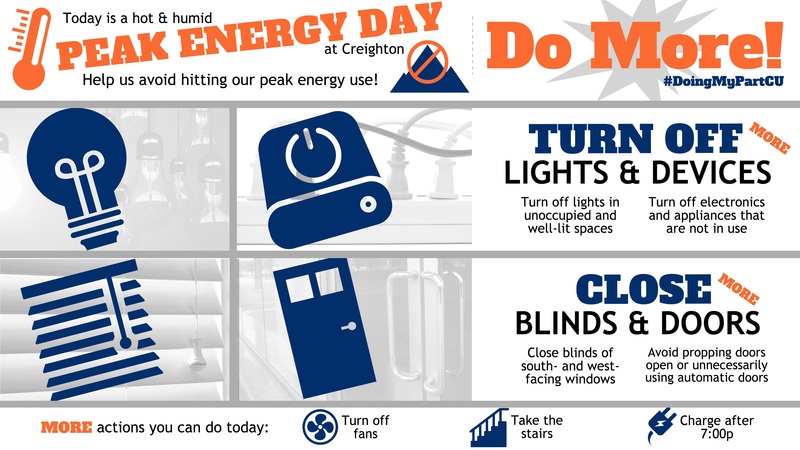 Creighton University is an EPA Energy Star Partner. We are committed to continually improving our management of energy resources, which reduces both operating costs and related forms of pollution. We are proud to be part of the family of businesses who have joined with ENERGY STAR.